Ever since starting SCD I’ve felt like I’ve eaten a lot more meat than I used to. Lately I’ve been trying to make a few vegetarian meals because I liking skipping meat every once in a while. I also like to buy free range chicken and grass fed beef, which gets expensive, so going meatless once or twice a week makes the more expensive meat last longer. This recipe only includes one non-SCD ingredient – quinoa. 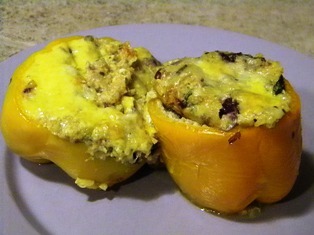 Article first published as Glute-Free Vegetarian Stuffed Peppers on Blogcritics. Because eating gluten-free means eliminating a lot of starchy foods, it can mean an increase in protein intake. More specifically it can mean an increase in meals that revolve around a meat dish. If you have also eliminated other types of grains and starches such as rice and corn, vegetarian dishes can be quite difficult to prepare. Beans and quinoa are good substitutes for meat. They are both high in protein and fiber. They are also low in fat making them a good choice for people trying to watch their cholesterol and saturated fat intake. Quinoa has a grain like texture but it is really a seed. It contains all eight essential amino acids making it a complete protein. Quinoa is also a good source of iron, calcium, and A and E vitamins. Quinoa makes a good substitute for rice as a side dish or as a main dish like in this recipe for Vegetarian Stuffed Peppers. The best way to cook quinoa is to soak it for fifteen minutes prior to cooking and then rinsing it. This takes away the slight bitter flavor it can have. Like rice, quinoa is cooked with two parts liquid to one part quinoa. For a softer quinoa two and a half parts liquid can be used. Quinoa cooks much faster than rice, making a good choice when you don’t have a lot of time. 2. Soak quinoa in a cup of water for fifteen minutes. Rinse. 3. Heat oil in a small saucepan over medium heat. Add onion, zucchini, spinach, and garlic. Sautee’ until the onion just starts to brown. 4. Add broth to pan. Stir in quinoa and cover. Reduce heat and cook for 15 minutes until liquid is absorbed and quinoa is very soft. 5. Pour beans into a large bowl and mash partially with a potato masher, so some beans are still whole. 6. Add quinoa mixture and grated cheeses to beans and stir to combine. 7. Allow to cool slightly then add eggs and mix well. 8. Cut tops off peppers and clean out seeds. 9. Fill peppers with bean and quinoa mixture. Top with slices of cheddar cheese. 10. Place in a glass baking dish with a little water in the bottom. Cover with aluminum foil. 11. Bake for 30 minutes. Remove foil and bake another 10 minutes. 12. Allow to cool for about 5 minutes.